My name is William. I am a professional dog trainer. 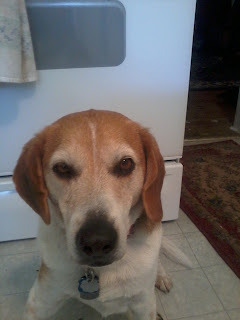 The cute little guy in the picture above is my sidekick and demo dog Copper the Beagle. Copper was added to our family on January 12, 2013. He is an adopted dog. I adopted him from his foster mom at Bully Wag. Copper is about 5 years old. We have really enjoyed working together over the past few months. Due to lack of exercise and a thyroid condition, Copper was quite overweight when he moved to his new forever home. Since then, we have been getting plenty of exercise together and are treating the thyroid condition with medication. Copper has learned how to properly walk on a leash, how to behave properly at a doorway and how to leave things alone that I do not want him to pick up. He just loves learning new things (and getting treats as a reward). Copper had quite a bad case of separation anxiety when he first moved in but, we are working on it and have made great progress! Copper and I are very happy to announce that we are starting a new dog training business! We look forward to helping other people to have better relationships with their dogs. We look forward to teaching you how to work with your dog to have a more polite and better behaved dog. I will be frequently posting tips, helpful dog information and updates to this blog. The importance of play for dogs.